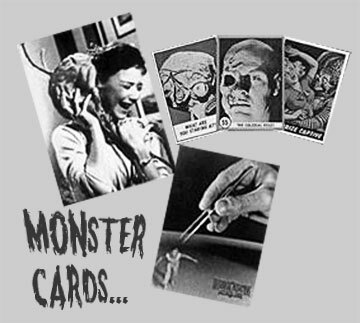 Throughout this entire site there are references to these wonderful monster figures from the 60's, but here, I will talk about them in detail. It's amazing to me how a certain piece of a memory can evoke a wave of emotions. One fall day in 1964, I came across a startlingly wonderful discovery in the basement toy department at Newberry's. First of all, it's a well-known fact that the toy department in Newberry's basement was, in fact, the eighth wonder of the world. There, resting in giant bins next to army figures and other toys were wonderfully colored creatures known as Universal Monster figures. 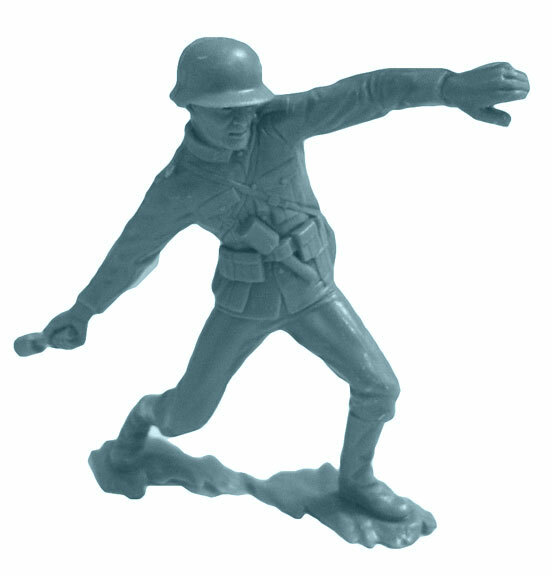 Owing to the influence of plastic army men, I was, as a kid-and still am today as an adult-fascinated with plastic figures. Like models, there was such artistry to the molding of them that they were worthy of studying for hours on end as well as playing with. 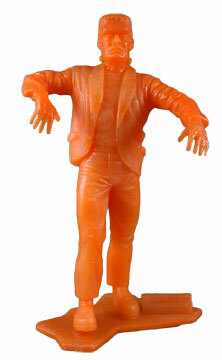 These wonderful monster figures came in different colors, some of which seemed like blazing neon. I had a green Hunchback and a bright orange version of The Wolfman, The Phantom, Frankenstein, and The Mummy. Eventually, I tried everything I could with them including, but not limited to, painting them with enamels like my monster models. (That was a disaster). Invariably, I ended up buying these figures again and again, not so much out of necessity, but because it was just so much fun to lay down a dime apiece and buy a new one. 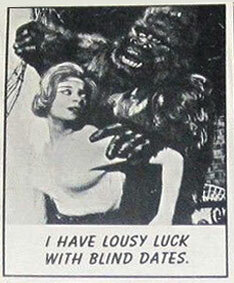 There was one day when I was playing with my monster figures in our gravel driveway. Nothing eventful had happened that day. I was just glad to be home from school, and out of the classroom doldrums. I suppose that day I may have done something miraculous to add a pleasing measure to an otherwise disgustingly ordinary day. 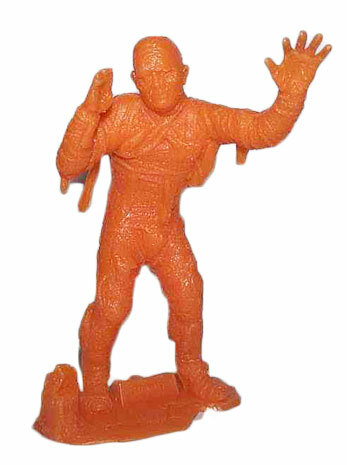 I really loved "The Mummy" and "The Hunchback" figures. Frankenstein was cool also, but The Mummy and The Hunchback were tops. "The Wolfman" and "The Phantom of the Opera" came in second but I loved them just the same. I had all of my monster figures set up in the gravel, and I'd made strange little caves out of rocks for The Wolfman to hide in and for Frankenstein to peer out-and appear out of. Beatle songs were playing in my brain and I was just happy to be enjoying that bit of free time playing with these incredible figures. I'd often just look at them, admiring the workmanship and the detail of the faces. As a kid, all of that stuff was important. I'd just been listening to "Mr. Moonlight" by The Beatles and Gale Garnett's "We'll Sing in the Sunshine" as I set up my figures in the driveway. My best friend at the time, Jerry, came over to check them out. Both of us were in awe at how such wonders were created and made available at such a reasonable price. 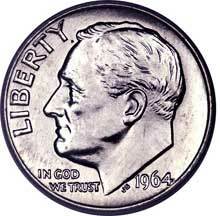 In 1964, ten cents was still a good piece of change, money to be taken seriously, but it wasn't a fortune either. Ten cents was reasonable. Ten cents also paid for the incredibly fascinating 6-inch army figures and cowboy figures by Marx, the same manufacturer as my beloved monster figures. 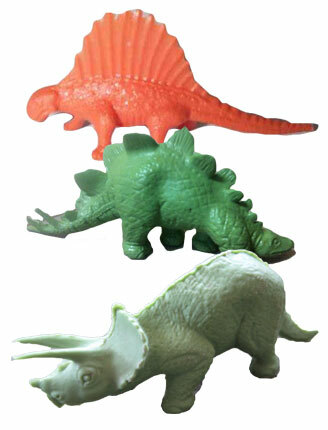 I also had a several plastic dinosaurs. I loved dinosaurs and there were many excellent plastic replicas that captured them in perfect detail. Around 1962 I had one set in particular that had the detail of models, and were larger. They were made of hard plastic and my mom got them for me at the downtown Portland Newberry's store. Plastic figures were the best, and I collected so many of them over the years. I can't begin to describe how many army men sets I'd gone through, traded, and re-collected over the years. 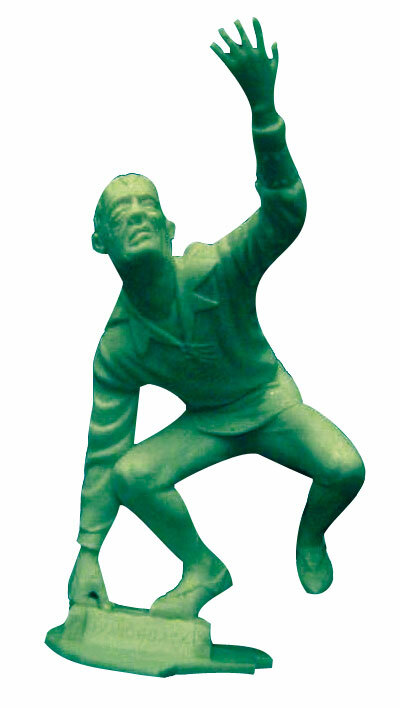 Army men were a source of fascination to me that was ceaseless. 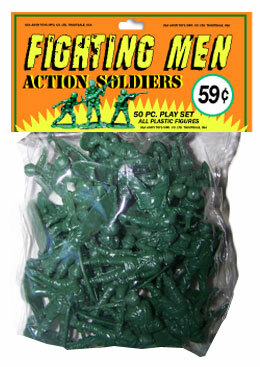 I never got tired of them, always collected them, and eventually had my own army of army men! Each set seemed to have a few different poses that I just had to have. One very rare set that I can recall had a few of dead soldiers that only added to the realism of the playing. I'd never seen plastic "dead" soldiers before and that made the set unique. 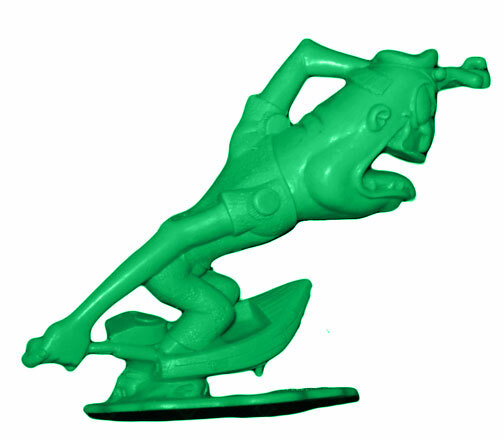 Plastic figures in general were incredible to me, but I loved army men more than any of them. 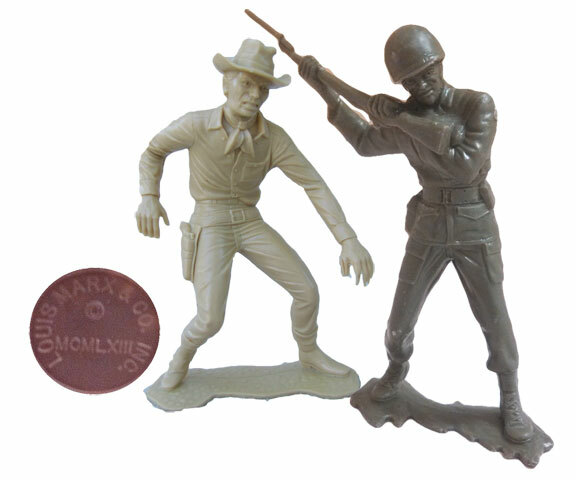 Marx Toys also produced army figures of different enemies such as Germans and Japanese soldiers. I had a couple of the Japanese soldiers and a few of the blue-ish colored German soldiers as well. The German soldiers were very cool. They also made Beatle figures but I can't remember if I ever had any of those. During this period I was also collecting Monster Cards that came in bubble gum packs. They were the best! The only thing I didn't like was the disrespect being showed these royal horror stars by adding comical captions on the cards. For the most part, these cards were outstanding, and captured images of some of the finest creatures around. I had a fairly good collection that I would often bring out to show kids on the block. 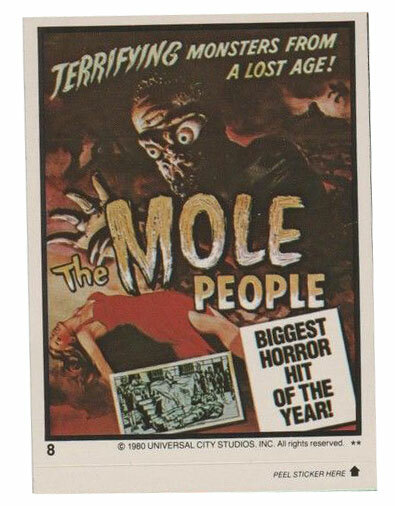 So many of these magnificent monsters hadn't yet made their way to our local TV stations, so we hadn't seen them in action. This only added to their mystery and majesty. Monster Old Maid cards were also so cool, that I had to play old maid every single day-even if I had to play against myself! 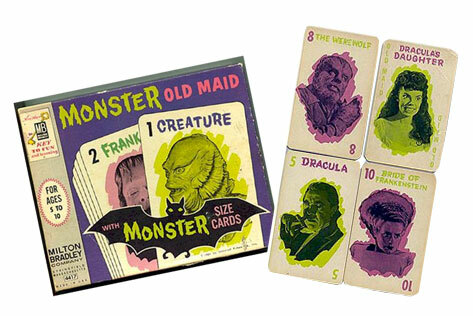 The monster old maid cards also featured some of the best monster photos ever, featuring some of Hammer Films finest, like "The Werewolf", and "Brides of Dracula" as well as the Lon Chaney Sr. Hunchback. Back to the monsters. Each time these figures arrived in Newberry's basement, the colors on some of them had changed. I saw many of the color changes, but only the brightest ones seemed to attract me. The blue molded colors seemed a bit dark, though I did love the green versions. I eventually bought the green Hunchback and it became my favorite in the color scheme. These unforgettable comic figures looked exactly like the creations of Ed "Big Daddy" Roth. As a kid, I thought that the "Nutty Mads" were indeed part of the "Weird-Ohs". Pictured is "Manny the Reckless Mariner", a figure I used to have as a kid. Many of my wonderful figures and toys were bought at the Newberry's at Eastport Plaza in the toy department downstairs. Each store had its own brands, and types of things they carried. All my Aurora monster models (at least for the first time around) were bought at Pay N' Save, a store that also located at Eastport Plaza. I don't recall any monster models being sold at Newberry's during my tenure in the great Powellhurst-Gilbert neighborhood. In later years, I re-collected many of these items, but nothing can beat that first time when wonderful toys like these enter a person's world and light it up forever. The result is magic, and for me, those incredible plastic monster figures by Marx were beautiful and have created timeless memories. All of that for a dime. You just can't beat that.